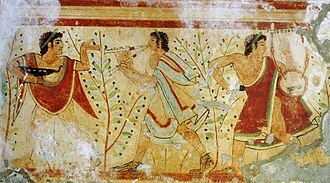 The Carpetani (Greek: Karpetanoi) were one of the Celtic pre-Roman peoples of the Iberian Peninsula (the Roman Hispania, modern Spain and Portugal), akin to the Celtiberians, dwelling in the central part of the meseta - the high central upland plain of the Iberian Peninsula. Since the 5th century BC the Carpetani inhabited the Toledo and Alcaraz highland ranges along the middle Tagus basin, occupying a territory that stretched from the Guadarrama river at the north to the upper Anas (Guadiana) in the modern provinces of Guadalajara, Toledo, Madrid and Ciudad Real, an area designated as Carpetania in the ancient sources. 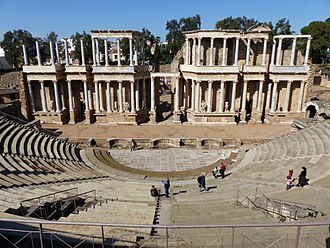 Main city-states (Civitates) in the region were Toletum (near modern Toledo; Roman or Celtiberian-type mint: Tole), Iplacea/Complutum (Alcalá de Henares – Madrid; Celtiberian-type mint: Ikezancom Konbouto? ), Consabura (Consuegra – Toledo), Barnacis (Orgaz – Ciudad Real; Celtiberian-type mint: Bornaiscom), Laminium (Argamasilla de Alba or Alhambra – Ciudad Real) and Alce (Campo de Criptana – Ciudad Real). Towns of lesser importance were Aebura (Cuerva – Toledo), Metercosa (Madridejos – Toledo), Ispinum (Yepes – Toledo), Miaccum (Casa de Campo – Madrid), Mantua (Montiel – Guadalajara), Thermida (Trillo – Guadalajara), Ilarcuris (Horche – Guadalajara) and Ilurbida (Lorvigo, near Talavera de la Reina – Toledo). The exact location of the remaining Carpetanian towns is either uncertain or unknown, this is true in the cases of Dipo (near Toledo? ), Libora, Varada, Titulcia, Caracca or Characa, Rigusa, Paterniana, and Alternia. The origins of the Carpetani are obscure though their ruling elite certainly had Celtiberian and Gallic-Belgae elements, whose ancestors arrived to the Peninsula in the wake of the Celtic migration at the 4th century BC; the rest of the population was clearly Indo-European and very mixed, including people of native Ibero-Tartessian and Indo-Aryan affiliation. Recent analysis of local epigraphic sources revealed that the Carpetani comprised some twenty-seven tribes, namely the Aelariques, Aeturiques, Arquioci, Acualiques, Bocouriques, Canbarici, Contucianci, Dagencii, Doviliques, Duitiques, Duniques, Elguismiques, Langioci, Longeidoci, Maganiques, Malugeniques, Manuciques, Maureici, Mesici, Metturici, Moenicci, Obisodiques, Pilonicori, Solici, Tirtaliques, Uloques, and Venatioques. 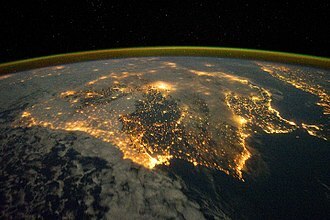 In archeological terms, it is now believed that they stemmed from both the transitional Late Bronze Age/early Iron Age ‘Campiñas de Madrid’ farmers’ and the ‘Cogotas I’ cultural groups. Only a few Carpetanian towns appear to have issued their own currency, modelled after Roman patterns copied directly or adapted via Celtiberian coinage. In the 2nd century BC, Iplacea/Complutum and Barnacis struck coins with their names marked in Celtiberian script, whilst later Toletum struck theirs bearing its name in Latin script. 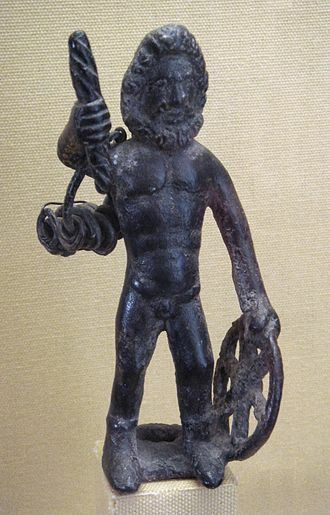 By the later part of the 3rd century BC, the Carpetani had evolved into a sort of federation or loose tribal confederacy whose nominal capital was set at Toletum, with several centres of power in the main towns ruled by petty kings (Latin: Reguli). 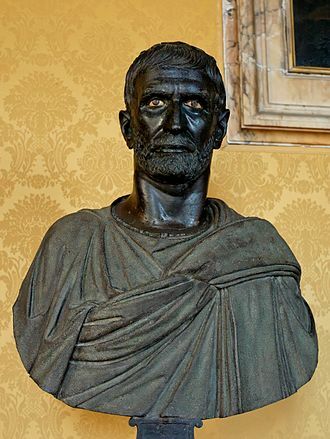 Some of these Rulers appear to have risen to prominence in the early 2nd century BC – one king Hilernus led a coalition of Carpetani, Vaccaei, Vettones and Celtiberians against consul Marcus Fulvius near Toletum in 193 BC, but he was defeated in battle and captured; another Regulus, Thurrus, ruler of Alce signed a treaty with Tiberius Sempronius Gracchus the Elder in 179 BC. Prior to the Second Punic War, they opposed Carthaginian expansion in central Spain, but in 219 BC Hannibal defeated a combined force of Vaccaei, Olcades and Carpetani, thus completing his conquest of Hispania south of the Ebro with the exception of Saguntum. 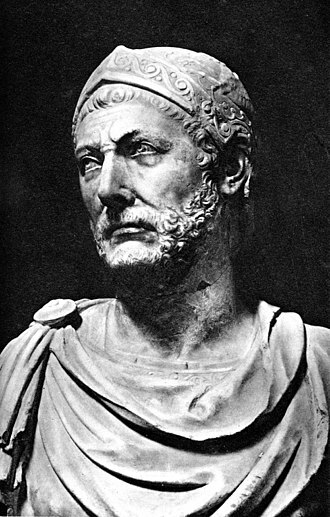 They also provided mercenary troops to the Carthaginian armies, for Frontinus mentions the desertion of 3,000 Carpetani warriors from Hannibal’s army when he entered in Italy after crossing the Alps. ^ Livy, Ab Urbe Condita, 39: 30. 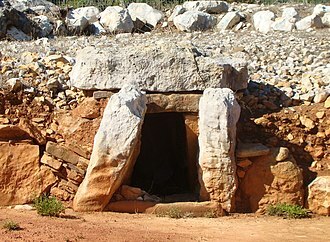 ^ Some archeologists place it somewhere between Augustobriga and Toledo, in either Cuevas or Montalbán. ^ Herodotus, Istoriai, II, 33; IV, 49. ^ Strabo, Geographikon, III, 4, 12. ^ Pliny the Elder, Naturalis Historia, III, 29. ^ Julián Hurtado Aguña, Las gentilidades presentes en los testimonios epigráficos procedentes de la Meseta meridional (2003-2004), pp. 185-206. ^ Jesús Corrobles Santos, Los Carpetanos, in Prehistoria y Protohistoria de la Meseta Sur… (2007), pp. 194-195. ^ Livy, Ab Urbe Condita, 29: 40, 49. ^ Polybius, Istorion, III, 13-14. ^ Livy, Ab Urbe Condita, 21: 5, 2. ^ Frontinus, Stratagemata, II, 7. Wikimedia Commons has media related to Carpetani. The Alhambra, the complete Arabic form of which was Qalat Al-Hamra, is a palace and fortress complex located in Granada, Spain. It was converted into a palace in 1333 by Yusuf I. After the conclusion of the Christian Reconquista in 1492, the became the Royal Court of Ferdinand and Isabella. Alhambras late flowering of Islamic palaces were built for the last Muslim emirs in Spain during the decline of the Nasrid dynasty who were subject to the Christian Kings of Castile. 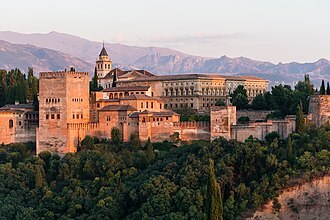 The Alhambra is a UNESCO World Heritage Site and the inspiration for many songs, Moorish poets described it as a pearl set in emeralds, an allusion to the colour of its buildings and the woods around them. The palace complex was designed with the site in mind. The park has a multitude of nightingales and is filled with the sound of running water from several fountains. These are supplied through a conduit 8 km long, which is connected with the Darro at the monastery of Jesus del Valle above Granada, Alhambra was extended by the different Muslim rulers who lived in the complex. However, each new section that was added followed the consistent theme of paradise on earth, column arcades, fountains with running water, and reflecting pools were used to add to the aesthetic and functional complexity. In every case, the exterior was plain and austere. Sun and wind were freely admitted, red, and a golden yellow, all somewhat faded through lapse of time and exposure, are the colors chiefly employed. Much of this ornament is carved stucco rather than stone, tile mosaics, with complicated mathematical patterns, are largely used as panelling for the lower part. Similar designs are displayed on wooden ceilings, muqarnas are the main elements for vaulting with stucco, and some of the most accomplished dome examples of this kind are in the Court of the Lions halls. It is a place where artists and intellectuals had taken refuge as the Reconquista by Spanish Christians won victories over Al Andalus, the literal translation of Alhambra, the red, reflects the color of the red clay of the surroundings of which the fort is made. Las Cogotas, is an archaeological site in Spain in Cardenosa municipality, province of Avila. The site was researched by the Galician archaeologist Juan Cabré in 1920s and it is namesake for two different archaeological cultures known from this site, Cogotas I of the Late Bronze Age and Cogotas II of the Iron Age. This culture, which existed around 1700—1550 BC, is known as Cogeces horizon. 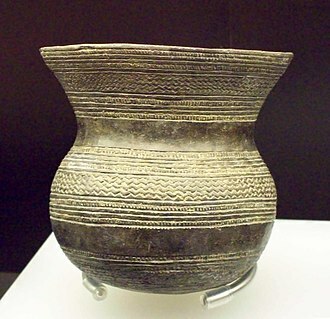 Although Protocogotas culture was not represented by finds in La Cogotas, characteristic for this culture is black pottery with incised geometric motives incrusted by white paste. Vessels were relatively small, flat-based, rough, supposedly used as kitchen ware. Chronology of Cogotas I, Formation stage,1700 BC incised, one of them were Vettones, most probably of Celtic origin. Characteristic for Cogotas II cultures are verraco statues and these are stone bovine statues situated on pasture lands, whose exact usage is still unclear. Among other material culture objects there were daggers, flat axes, copper axes, granite grindstones. Campo de Criptana is a municipality and town in the province of Ciudad Real in the autonomous community of Castilla-La Mancha. It is found in the known as La Mancha. The area surrounding Campo de Criptana has been inhabited since prehistoric times, prehistoric implements of hunting and agriculture have been found in various locations, as have ceramics, particularly from the Bronze Age. From historic times, the most plentiful remnants have been Ibero-Roman, settlement of the present city center of Campo de Criptana dates from the 13th century, though the municipal area was occupied by human beings much earlier. 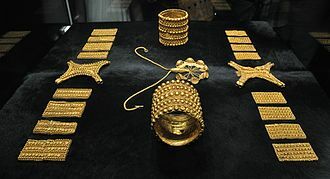 Numerous archaeological remains and historical documents attest to the existence of inhabited centers since the Bronze Age, it passed to the Order of Santiago, forming the center of an estate that had property in Villajos and Pedro Muñoz. By the 14th century it was again depopulated, some four kilometers to the north of the current city center, had been peopled since prehistoric times. It appears in a citation from 1162, together with Chitrana, Spain, in various medieval documents it is mentioned under other names such as Villa de Alios and Villa de Ajos. It was depopulated from the 12th century, and the current hermitage was built over the church of its city center. Hardly any documented information exists about Posadas Viejas, except that it was situated near Camino de la Puente, south of the present railway line, and that it was depopulated around 1300. El Campo grew up in the current location of the city center, around a position of the Cerro de la Paz. The towns referred to above disappeared, giving way to the new community, named Campo de Criptana, it is first referred to in documents from the early 14th century. 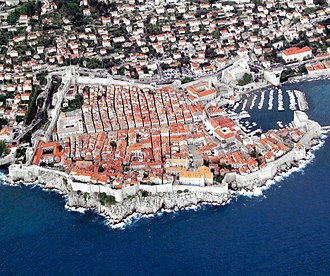 Throughout the Middle Ages, the population of the center grew. The survey records of Philip II report some 1,000 households, from this time its population shows the unfortunate state of a rural society affected very severely by climate, epidemics of disease, poor harvests, and excessive taxation. Talavera de la Reina is a city and municipality in the western part of the province of Toledo, which in turn is part of the autonomous community of Castile–La Mancha, Spain. 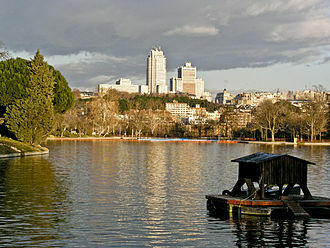 It is the second-largest population center in Castile–La Mancha and its population of 83,793 makes it larger than the city of Toledo, although the latter remains the provincial capital. The city is settled along the river Tagus at a broad bank, there are two islands in the center of the city called Isla Grande and Chamelo Island. 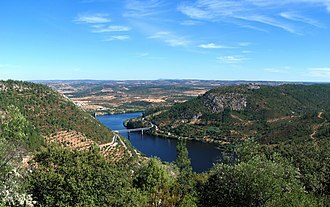 The city is surrounded by two ranges of mountains, in the north the Sierra de San Vicente, and in the south Montes de Toledo, the city is divided in two by the river Tagus. 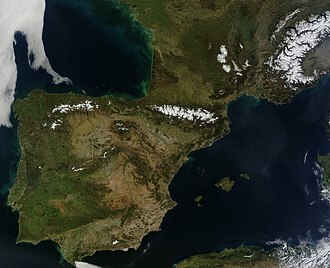 The northern part is the larger and more populated, both parts are connected by three bridges, one of them built in the Middle Ages, overall the climate is slightly warmer than Madrid. The area is fertile with Mediterranean forests, olive trees. The city is known for its ceramics, which Philip II of Spain used as tiled revetments in many of his works. The nickname of Talavera de la Reina is The City of Pottery, mexicos famous Talavera pottery was named after the city. There are remnants of prehistoric cultures in the area, the village was founded by the Celts as a ford of the Tagus. The first mention of the city occurs in Livys description of a battle between the Romans and the Carpetanoi, a Celtiberian tribe and its modern name is derived from Talabayra, the Muslim rendering of this Visigothic name. The city was conquered by Muslim forces in 713 and conquered by Christian forces under Alfonso VI of Castile in 1083, Talavera de la Reina was founded at the confluence of the rivers Alberche and Tagus. This area of great wealth was the settlement of Celtic people who built the most ancient ruins of the area. During the time of the Roman Empire the name of the city was Caesarobriga, the leader Viriato, in his war against the Romans, lived in this territory between 145 and 139 BCE. In this period Talavera de la Reina was a city with cattle markets. Guadalajara is a province of central/north-central Spain, in the northern part of the autonomous community of Castile–La Mancha. As of 2013 it had a population of 257,723 people, the population of the province has grown in the last 10 years. The province has been inhabited since the Paleolithic as evidenced by stone tools found on the banks of the Henares and Linares rivers. There are remains of bronze age settlements along the river banks in the area. 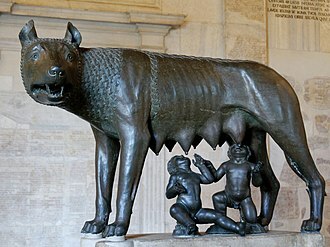 In addition to raising livestock and breeding horses, they created many fortified towns, between 143 and 133 B. C. the Romans initiated their battles to conquer Spain which continued until 94 B. C. They brought agriculture and commerce to the region, facilitating communications with roads, the most important Roman city was Segontia although they built a town wall around Luzaga where there were large public buildings. The Visigoths, with their capital at Toledo, were dominant in the area around the 6th and 7th centuries A. D. bringing Christianity, in 578, King Leovigild founded Recópolis on the River Tagus with a basilica and a palace. The Moors arrived in the area in c,711, establishing Islamic rule for some four centuries until the early 13th century. 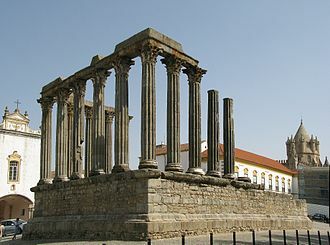 Their most important contribution was founding of the capital, the territory now covered by the Province of Guadalajara was part of the Moors Marca Media. 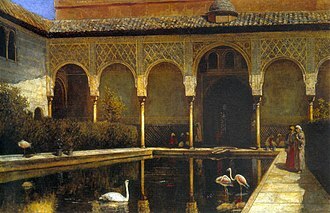 Generally sparsely populated, the most important towns were Atienza, Jadraque, following the dismemberment of the Caliphate of Córdoba, Toledo gained independence in 1018, reaching its zenith under Yahya-al-Mamun who reigned from 1043 to 1075. 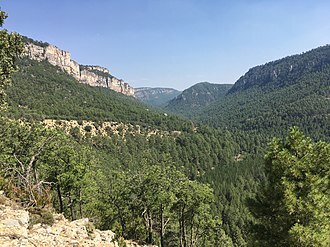 Following his death, pressure from King Alfonso VI of León, by the early 12th century, Molina, La Serrania, Sigüenza and the Tagus Valley were retrieved leading to the establishment of the Bishopric of Sigüenza. Under Alfonso VII and Alfonso VIII, the region was repopulated with people other parts of Castile. The modern age began with the Catholic Monarchs, Isabella I of Castile and Ferdinand II of Aragon whose marriage in Valladolid in 1469 united the crowns of Castile and Aragón.